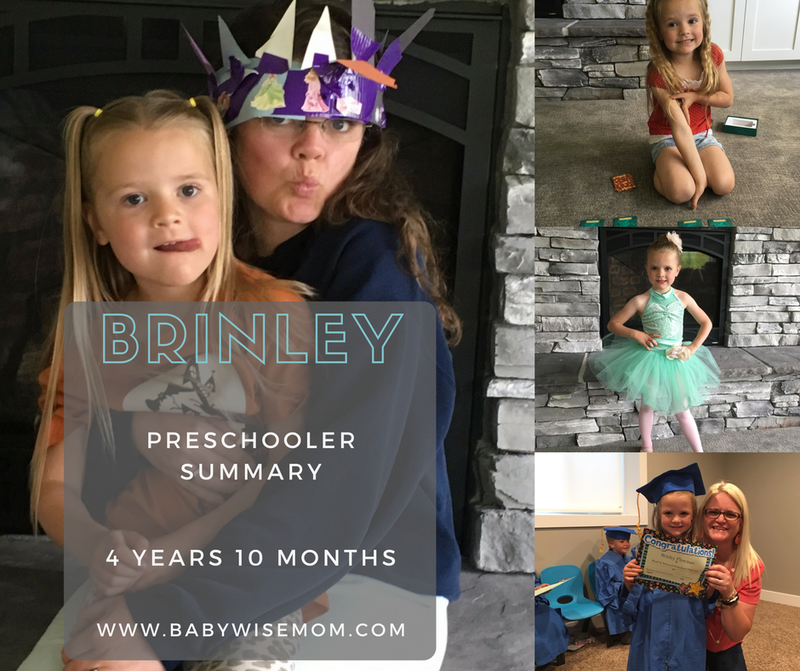 This is a summary for Brinley from 4 years 9 months to 4 years 10 months old. She spent the month being very obsessed with Moana. She also loved playing the game Sleeping Queens over and over, sometimes with her imaginary friend (whom she talks to like a real person. Even getting mad). This preschooler also loves making crafts for people. You can see the lovely crown she made for me for Mother’s Day in the photo just below. You can always find more of her on Instagram. Sleep is great. She sleeps 11-12 hours at night (usually 12 or a bit more). She does not nap, but she does have rest time each day. Eating hasn’t changed much. Something common with this age group is for the child to eat a few bites and say she is done. The tricky thing that happens is then she goes to play and comes back an hour later, insistent that she is starving. This can stress parents out and can easily lead to you letting a snacking habit start up. Your preschooler doesn’t need to eat every one hour if your newborn ate every three. When Brinley eats very little at a meal, I ask her if she is sure. I tell her when she will be able to eat again and ask if she thinks she needs to eat more or if she is really done. She usually says she is done. Then about an hour later, she lets me know she is hungry. I remind her of the conversation we had and explain that she will have to wait until the next meal (or whatever I had told her before). The child will survive just fine. Don’t stress! Brinley finished up soccer this month. She totally loved it the whole time! She was so excited to do it after years of watching her siblings play. Brinley finished up her second year of dance. She had her recital and was so cute. She told me she doesn’t love dance class because they tell her how to dance and she wants to dance her own way. She loved her teachers and had two good friends with her, so she had fun and she loved dancing on stage, but she apparently prefers dancing to her own choreography. Brinley graduated preschool! 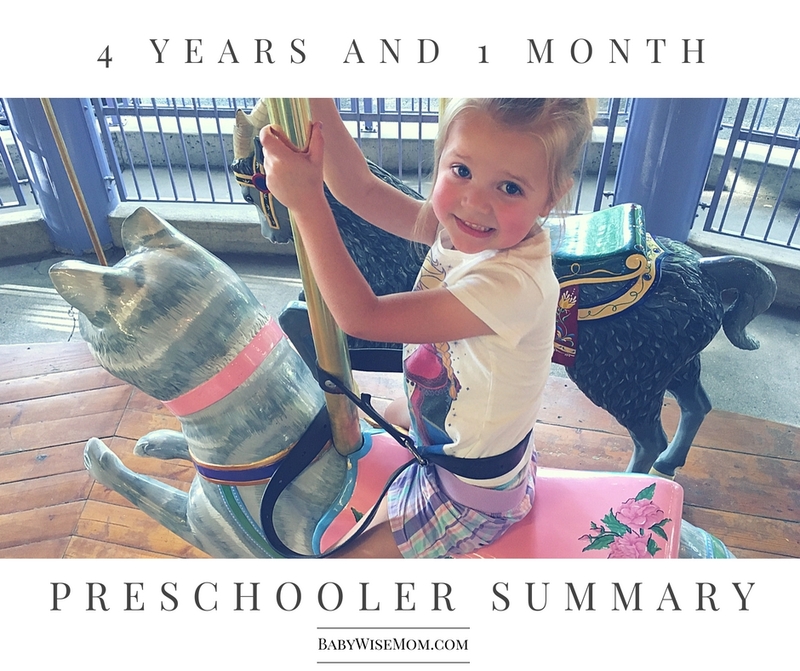 She loved preschool and always wanted to go longer and more often. She was so sad to see it end, but she is so very excited for Kindergarten to start. One thing she was super sad about with preschool ending was that she was going to miss her preschool teacher. She had a great teach and Brinley just adored her. When I told her it was the last day of school, she threw herself into a heap on the floor and declared, “But I will never see Miss Jen again!” Um…yes you will. Luckily for her, Miss Jen is a friend of mine AND her daughter play’s on McKenna’s soccer team, so she will see Miss Jen plenty. 4:00ish–Get up up. Play PBS Kids on the computer. Then dinner and family time. School days are much the same with a 12:15-2:40 time at school. She started rest time as soon as she got home. I definitely would have preferred her preschool time be in the morning, but this was the time available. I requested morning Kindergarten for this next year because having something in the afternoon proved to me what I already thought to be true–we are morning people and prefer to have things started and done in the morning. The only tricky thing will be getting three girls ready in time. I might have to abandon the notion of me being ready first thing in the morning and just get ready once they are gone…we shall see. Yes to the preschool eating! We are in the same boat with this and (attempt) to handle it the same way! Glad to know we're not alone! This is a summary for Brinley in her first month as a four year old. Sleep was so great. She has been going to sleep so cheerfully ever since I told her she wasn’t allowed to get upset at nap time. She is still doing so well with that. Eating is very normal. Brinley has a funny quirk. She always thinks she is very, very hungry at the beginning of a meal. She will tell you a long list of everything she wants to eat at the meal. She goes down a long list and never makes it past her first meal planned at the meal. Swimming lessons is also going very well! She is swimming around and enjoying it so much! Dance started for Brinley this month. This year, she has two of her good friends in her dance class with her. She is excited about that, and I am too because carpool! Oh summer. We had a lot of fun. But I was SO GLAD to see it end. Brinley needed more structure and consistency all around. I mean, summer can really get to be unpredictable, but you add in the Olympics at the end of summer and everything just goes out the window. Each Sunday, we go through the family calendar. the week that the older kids started school, I said that school started that week. Brinley cheered and threw her arms in the air. I quickly told her, oh sweetie, not for you yet. The tears immediately came streaming down her face. She will start preschool soon, but it wasn’t in this month. Needless to say, she is so excited. She asks each day when school starts. She does like to wear her backpack everywhere to make herself feel better. School will start. Just not yet. When Kailtyn was four, she was super, super emotional. Super. Upon asking around, I quickly realized this is very common for girls to be emotional as four year olds. Oh my. I am not a pro at dealing with emotions. McKenna was not an emotional four year old. I figured Brinley would take the emotional path. She is more similar to Kaitlyn in that way. She can literally be in tears one second and laughing hysterically the next. Literally (and I know how to use that word correctly). It is pretty amazing. I have to just find it amusing. The upside of the emotional four year old is that she shares her happy emotions. She tells me, “Mama, I love when you hug me because it makes my heart grow bigger and bigger!” She may cry a lot, but she also loves a lot. 4:30 or 5:00–Wake up. Eat dinner. Then family time.